Lucky, lucky, lucky! Follow two adorable friends at play in a read-aloud for the very young that trips off the tongue. Ready, set, go! Whether you're playing pretend games (beep, beep) or flying off the slide (ka-thump), flopping into a puddle (splish, splash) or running around a tree ("Can't catch me! "), an afternoon at the park is so much better when your best buddy is there. 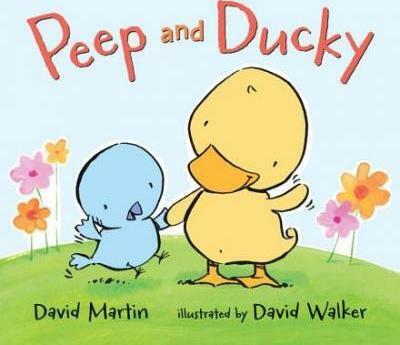 Peep and Ducky share giggles and tickles and bumps in this sweet excursion from David Martin and David Walker. The couplets make for easy reading, their sing-song quality lending them to large crowds or one-on-one interactions with equal ease. Likewise, the buoyant mixed-media art neatly complements the up-tempo tone. Cute without being cloying, these pudgy feathered stand-ins for child readers are bound to entice small listeners to clamor "Again" when the story's done. --Kirkus Reviews This picture book, starring big yellow Ducky and small blue Peep, is tailor-made for toddlers...The text is bouncy and the mixed-media art, rendered in a cheerful palette, is muted in the background, while the foreground pops with heavily outlined characters. --Booklist In the mixed-media illustrations, the two characters are consistent in size and color, and backgrounds show a pleasant park setting. --School Library Journal The rhymed verse has a playfulness that echoes the birds' light rambunctiousness...It's a quiet but well-observed portrait of a budding friendship. --Publishers Weekly [T]he rhyming text is great fun to read aloud--a bonus for adults, who will be asked to read this multiple times, and who won't mind experiencing this idyllic play date again and again. David Martin has written many books for children, including Let's Have a Tree Party!, illustrated by John Manders; All for Pie, Pie for All and Little Bunny and the Magic Christmas Tree, both illustrated by Valeri Gorbachev; and We've All Got Bellybuttons!, illustrated by Randy Cecil. David Martin lives in Vermont. David Walker has illustrated several children's books, including Flip, Flap, Fly! by Phyllis Root and Bears on Chairs and Bears in Beds, both by Shirley Parenteau. He lives in Chapel Hill, North Carolina.